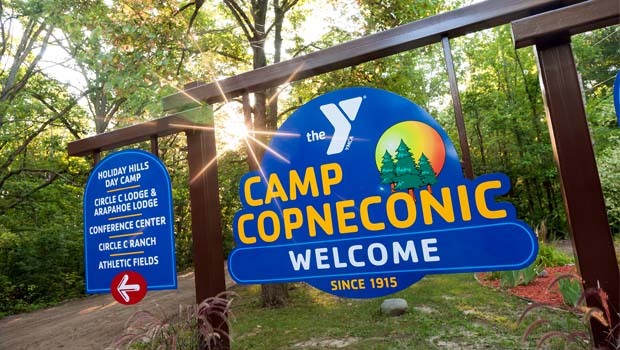 YMCA Camp Copneconic in Fenton is known as one of the best camping experiences in the Midwest. It offers something for everyone with traditional camp activities, combined with adventures such as zip lining, water sports, rock wall climbing, horseback riding and much more. Through thoughtfully designed camp experiences, campers develop skills that will serve them for life. YMCA Camp Copneconic is a positive force in the lives of children, providing enrichment in a number of key developmental areas that promote personal growth, something camp staff refers to as the Camp Copneconic Cs. Confidence – Whether it’s conquering the ropes course for the first time or mastering archery, a week at Camp Copneconic spurs confidence and personal growth. Camaraderie – Campers develop lifelong friendships that benefit them for years to come. The feeling of camaraderie, inclusion, and being accepted and appreciated as your true self is our culture. Caring – We pride ourselves on our caring staff and counselors. Staff instill caring for oneself and others through the programs and activities they facilitate. Collaboration – Through the principles of good sportsmanship and team building activities, campers learn to share and collaborate. Character – Camp Copenconic builds character with camping activities and adventures that emphasize respect for oneself and others. Forming lifelong friendships, participating in activities that help kids conquer fears, and building character are all part of the camp experience that builds confidence and fosters independence. The YMCA Camp Copneconic experience impacts campers for life, leaving them with lasting values, skills and qualities. Sure, time spent at camp is fun and adventurous, but it also serves as something much more. It helps build a guiding compass of values and character that stays with kids well beyond their time at camp – pointing them in the right direction for life. Learn more about YMCA Camp Copneconic’s Right Direction for Life experiences by calling 810-629-9622 or log on to campcopneconic.org.